It is spring, and once more my thoughts turn to the fancy of weeding. I’ve some new thoughts on the subject, as well as reposting excerpts from my first Weeding post in 2010. Good reminders. The great Dame Agatha Christie maintained, “The best time to plan a book is while you’re doing the dishes.” Let me tell you, weeding is even better. When you’re weeding, you get the sun on your head, or enjoy the shade, and there’s no one sitting at a nearby table, watching and talking to you. Weeding the garden remains the one solitary activity where others don’t seem to want to join in. I go out to weed and magically everyone disappears. So does the world. I’m left with blessed quiet and my own great imagination. Weeding is one of the most sensual and pleasurable pursuits. Knees on the moist earth, warm sun on my back, I make order in my garden, and in my mind. There is nothing like weeding for stimulating thought. Stella d'Oro leaves poking up, surrounded by some annoying and prolific round weed I've forgotten the name of, but looking closely, a few stems of chickweed show at the bottom of the photograph. Spring comes, weeds pop up, and so does my urge to write. Reading old posts and thinking back, I see that this happens year after year. Clearly, there is a correlation here, one to which I’d do best to pay attention. It might be well to start marking my calendar for the event, preparing writing ideas, blocking out writing days–get ready as for a long holiday– or holy days. There are so many sides to me: the Writer, the Mother-Nurturer, the Gardener, the Finder-of-All-Lost-Things. Not to be overly simplistic but men writers get to be writers, period. Women writers balance the world. And I bet Anonymous loved to weed, too. I’ll put my “crop” of weeds up against yours any day!! I always think of weeding or digging in the dirt as therapy. For me, it clears the mind, helps get rid of the worries for a little while anyway. Here in middle Oklahoma, we have gone from no winter straight into summer – 88 degrees today, 98 in Altus. Happy weeding to all of us! 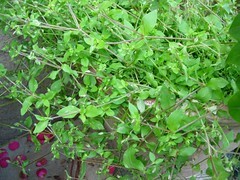 Your little round-leaf weed is Dichondra carolinensis, commonly called Pony’s Foot. It weeds easily, like pulling a thread that was chain-stitched. Chickweed will die off as soon as the hot sun shines on it for a few days. I’m pulling great wads of wild Geranium before the stork’s bill seeds set. I left another weed today ‘in case it is something.’ It always is ‘something’ — another weed! Thanks for the name Pony’s Foot, Nell Jean! I must look that up. I read one Alabama gardener who loves it for ground cover, which is does well. 🙂 I love oxalis, but I’ve noticed that other people consider it a weed. One man’s weed, another one’s flower. Finally I can read about someone else who loves to weed. I am enjoying and relating to many of your comments. I am a big fan of all your books and looking forward to your new one. I live in a small community near Raleigh, NC that is rapidly changing to housing developments. I miss the open fields, but realize that my neighbors and I will profit as our land becomes more valuable. If we could move all the friends and neighbors and our church to a new location, I would very happy. Please continue to up date us on the chicks. I hope the little one is having a good day, eating plenty of the chickweed, and growing to become as big as the others. Dear Betty– I so relate to the growth all around your community. We experienced the same in our old home in Oklahoma, and just this week, I’ve noticed growth around the rural-suburban area where we live here in south AL. My Great-Uncle Willie, a farmer in Weeksville, NC, used to say: “They’re just pinchin’ the land away…pinchin’ it away, and soon there won’t be any farms…” Thanks for sharing the chicks. Princess Puny seems to have suddenly begun to grow by leaps and bounds!